Sandy Creek High School’s Air Force JROTC flight honors those lost in the 9/11 attacks at their first annual 9/11 Commemorative Ceremony. Photo/Submitted. Students at a number of Fayette County schools made a statement on Sept. 11 by remembering that staggering loss of life that occurred on Sept. 11, 2001. Above, Sandy Creek High School’s Air Force JROTC flight honors those lost in the 9/11 attacks at their first annual 9/11 Commemorative Ceremony. Photo/Submitted. “Schools across Fayette County marked the 17th anniversary of September 11 by remembering the men, women and children who lost their lives on that tragic day and honoring those who serve and protect our country,” said Fayette County School System spokesperson Nia Washington. 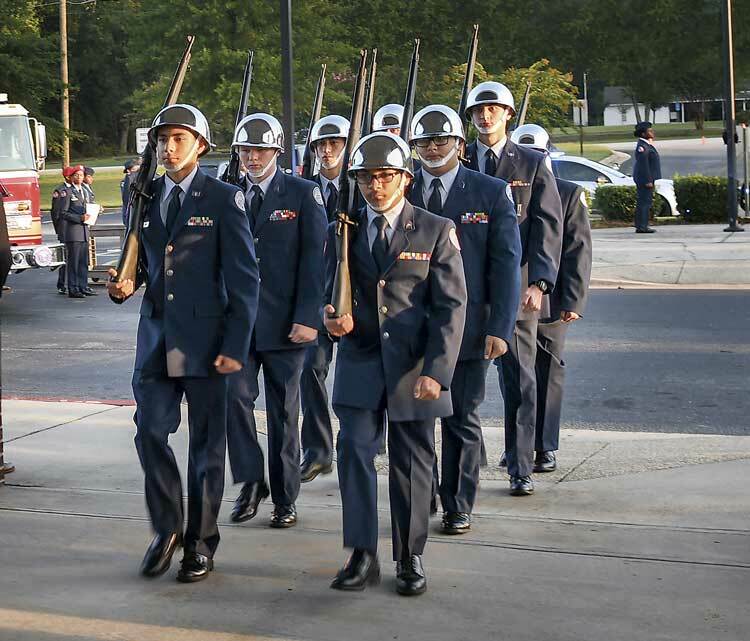 At Sandy Creek High School, Air Force Junior ROTC (AFJROTC) members hosted their first annual commemorative ceremony to honor and remember those who lost their lives on Sept. 11. Cadets also led the “Tolling of the Bell” where a bell rang 17 times to mark the 17 years of the tragic event. Fayette County and Tyrone first responders were also in attendance and received special recognition for their service, Washington explained. “This ceremony is important to Sandy Creek because it is the first of its kind. Also, most of the students at Sandy Creek weren’t born in 2001 and know nothing about this historic event, we want to show them why it’s important to remember this date,” said Sandy Creek High’s AFJROTC program director, Major Shon Dodson. Washington said Young Americans for Freedom, a student organization at McIntosh High School, placed 343 small American flags on the schools’ grounds to memorialize the 343 fire fighters who lost their lives. “A vintage firetruck parked on McIntosh’s campus was used as an outdoor classroom opportunity where gifted English students gathered to share their prepared commemorative poems during class,” Washington said. Peeples Elementary honored Patriot Day by wearing red, white and blue, Washington noted, adding that Oak Grove Elementary and Whitewater Middle students participated in lessons focused on the events of Sept. 11. Student ambassadors at Whitewater High and Chick-fil-A Town Center in Fayetteville collaborated to host an annual recognition breakfast to honor the men and women of the Fayette County emergency services. Previous articleIs Airport Authority gouging leaseholders?